We thank all the judges, friends & mentors that have contributed towards Meazys incredible success. This lovely, history making dog truly is the 'real deal'. Honest, sound, versatile & always 'merry' ~ a genuine Gundog who loves to compete, 'work' & he has triumphed in oh so many areas. He will now just attend the odd show here & there as he really has nothing else left to prove. He may even make a return to the Trial ring & finish off a few more titles ~ we'll just wait & see see how we all feel! With his perfect health scores & results, his super CORRECT, TRUE, CLASSIC 'HALLMARK' MOVEMENT, so easy & 'STRICTLY HIS OWN', Meazle, who stands bang on the breed standard height, has excelled in everything we have asked of him & more. He is quite simply an outstanding ambassador for his ancient & noble breed. He is amazing, consistent & a once in a lifetime dog. 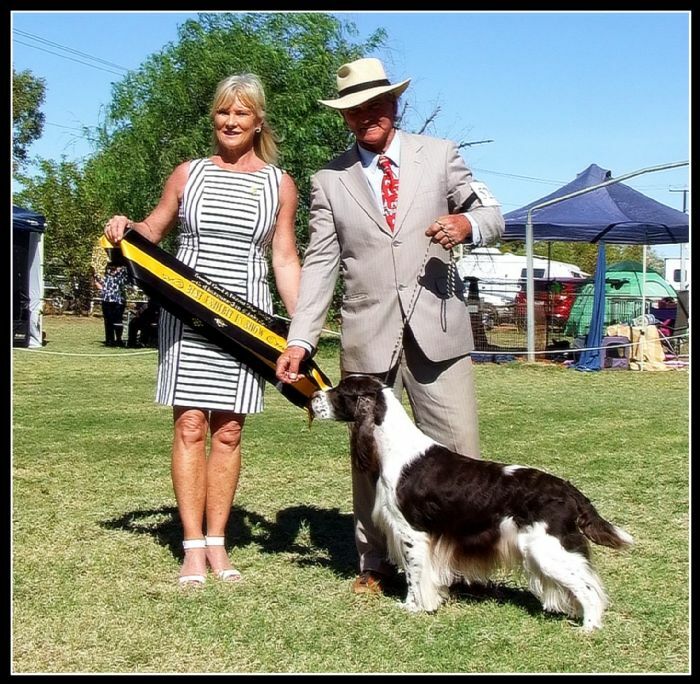 ~ BEST EXHIBIT IN SHOW ~ “I thought him a very typical specimen & as I said, the final decider for him winning BEST IN SHOW was that his MOVEMENT IS CORRECT & A HALLMARK of the breed. 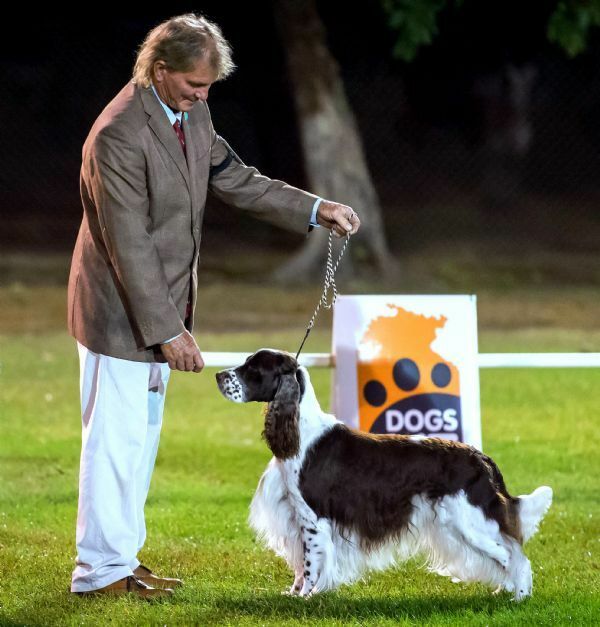 Do hope you keep moving him at the right pace & not rushing him around although I know the temptation is huge to do so as so many judges want generic show dogs....."
~ R/UBISS & BOB ~ "CORRECT SIZE & BREED TYPE. EXCELLENT WELL BALANCED head with CORRECT PROPORTIONS. Good pigment & DARK eye. Correct front AND rear angulation. CORRECT topline AND tail set. Shown in lovely condition with good coat. Loved his overall size & balance. Moved SOUNDLY with that easy CORRECT flowing ESS gait. Pleased to award him R/U BEST IN SHOW"
~ R/UBISS, BOB, VIS & ABIS ~ "..CORRECT masculine male of STRONG BREED TYPE. Compact with EXCELLENT proportions & racy outline. Broad, rounded skull with some fluting. Lobular ears set in line with CORRECTLY shaped almond eyes. EXCELLENT length of neck into MODERATE shoulders. Strong slightly arched loin into CORRECT lowset tail. Excellently presented. Moves with BALANCE & SWINGING front action. A QUALITY example of the breed"
~ BOB & VIS ~ "Masculine Liver & white. A SUPER dog, only giving his age away with a few grey hairs, maintaining his presence of a QUALITY dog. CORRECT PROPORTIONS, balanced, symmetrical typical BALANCED head & fluting present, DARK kind eye. CORRECT length of neck flowing onto a level topline. Moved SOUNDLY with a MERRY & ACTIVE movement. Well presented & conditioned". ~ BOB, VIS & ABIS ~ "7 year old dog. Symmetrically built & BALANCED. Soft expression with the required fluting. WELL BONED dog with GOOD SPRING OF RIB. Well-muscled dog. MERRY & ACTIVE on the move"
~ BEST OF BREED ~ "EXCELLENT breed type, a LOVELY WELL BODIED UP dog with CORRECT ESS MOVEMENT & level topline"
4-May-13 [RN] Qualifying Score, 94/100 & 4th place.